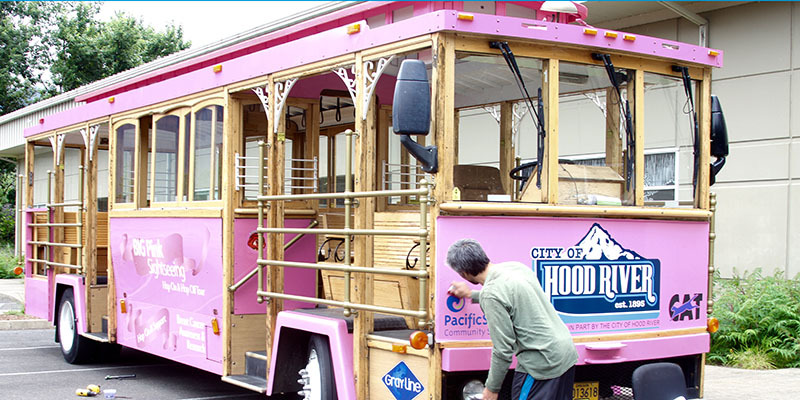 When the Hood River Trolly operated by CAT needed a freshen up, they chose vinyl wrapping. This vehicle only needed new branding which saved a lot of money. The top and insides were staying the same solid pink color. The sides are new. This meant it was very important to do a perfect job color matching the existing pink. Ian Connor’s – Finishing touches. Ian Connor’s is a color matching and correction pro. With over 25 years of experience, he sample swatched it and in a couple try’s the color was perfectly matched. The other requirement is that the Trolley has a schedule to attend to. From start to finish we had the vehicle for 2 days. She never missed a beat. If you curious about how much a wrap cost. Check out our vehicle wrap calculators. Obviously, when you look a wrap for a trolley you can see its pretty a pretty custom job. Well, that’s kind of true for every vehicle. All vehicles and businesses have slightly different needs and attributes. Which make each job a little different. This means pricing, is not an exact science. The calculators are a great tool that will get you enough information to plan your budget. When you’re ready to go for it. Please give us a call or contact us and we will give you an accurate quote with installation time.